Not just pictures, see working what you buy! 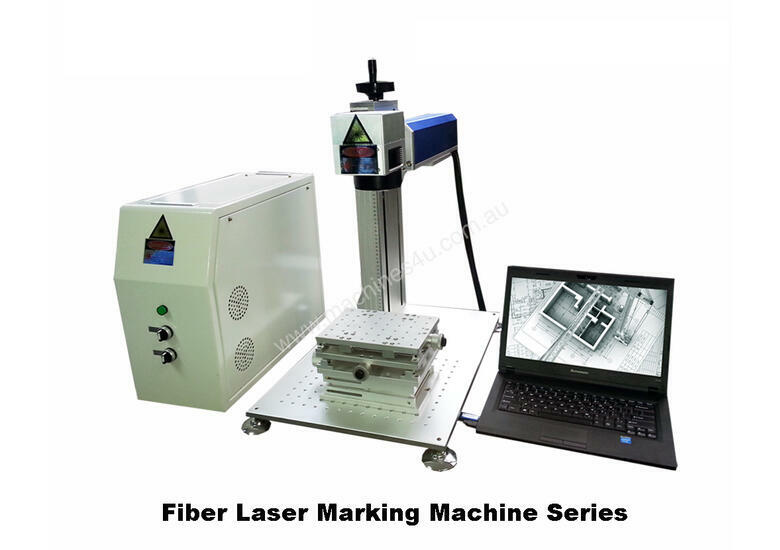 High power 20W 1064nm Fiber Laser Marking System. In stock, selling now a superseded model. Used only for demo, only 100 hours operating time. Save thousands off a new one. Simple and powerful EZCad processing software installed on a new laptop , it handles vector files, bitmaps, etc. Quality theta lens with 70X100 field. X/Y positioning table and operator protection glasses included. Quality manual gearbox Z axis (focusing) with easy to read numeric scale. Single phase power supply 240VAC/6A. Red dot pointer, field and mark contour, frame and complete mark projection on the job via 650nm laser diode. Fly mark, remote control mode, etc. Australian compliant safety enclosure with protective window and interlock, rotary axis with 100mm chuck available at extra cost, POA.